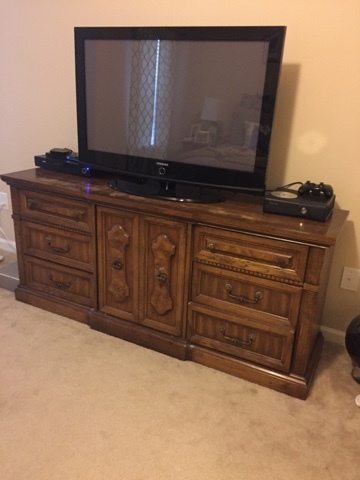 ok, this is going to be a long one because I am so proud and ecstatic about the work my mom and I did to completely update and upgrade stephen’s childhood dresser into a tv stand for our master bedroom. I have been wanting to do this project for literally years, but it seemed so daunting. all it took was for stephen to go out of town and my mom to come over with bricks (keep reading) and we hit the ground running. the whole project took less than one weekend to finish! this furniture update, plus the recent paint overhaul, and all the gorgeous curtains and pillows my mom made us means that our master bedroom is finally complete. ok, so here’s where we started. you know I’m terrible with getting good “before” pictures, this was taken on my iPhone to persuade my mom to come help me redo this piece. you can see that we had all this clutter on top of the dresser, which drove me crazy. in order to reduce the clutter on top of the dresser, we removed the swing door and added shelves, below. I also kept all the original hardware and spray painted it for a quick and easy update. you could easily pick more modern pulls, but I happened to like the traditional look of these pulls. I am thrilled with how it turned out. many, many thanks to my mom for all the work she did to help me with this. I love that the piece is a family heirloom, and will be useful for us for years to come. the first step is to remove all drawers and doors. this piece had a crazy door with hinges, we removed the door and hinges to get them out of the way. if you want to add center shelves – you must remove the wooden drawer anchors. I don’t know the proper name for them – but they are the long pieces of wood which the drawer slides onto, pictured below. believe it or not, most of this stuff budged pretty easily with my mom’s strength and a flathead screwdriver. once you’ve got that all out of the way, clean the piece up. this piece in particular was dirty! so much dust. this is also a good time to take measurements if you plan to add new shelves in place of center drawers. warning: this was by far the trickiest part and actually warranted two trips to home depot. I can’t stress how important it is to take accurate measurements and then reduce your measurements when you have your wood cut at home depot. the huge auto saws they use are not that accurate, and better safe than sorry. you’ll need to measure length and width for your drawers – be careful of any wood boning on the back of the dresser that could protrude. you can clearly see this vertical piece of wood below – be sure to only measure to the start of the boning. if you measure all the way to the back of the piece, your drawer won’t fit. if you have any questions about this, comment or email me. we went to home depot and used very thick plywood to cut the pieces – you’ll need 3 bases (reinforcement) and 6 sides for the shelves. also, be sure to measure them individually. our measurements varied for each shelf. I mentioned bricks above – we used bricks to hoist the piece off the floor since we painted the piece in its final resting piece. I don’t have a workshop and this piece is so heavy, plus I have two flights of stairs anyway – so yes, we paint in place and it’s easy! put your piece on bricks first, then slide the dropcloth over the bricks and under the piece and you’re good to go. this step takes the longest – sanding. sand the exterior of your piece and also the front of the drawers. we did this with a sand paper block (similar). my mom did the sanding, while I painted the new shelves we had cut at home depot. this is the part where I tell you our first round of shelves didn’t fit, they were off ever so slightly… I went back to home depot and we started over again since they couldn’t be salvaged. thankfully, home depot didn’t charge me again. this time we made sure the shelves fit before painting them, and they did! I used wood glue to secure the shelves in place. it would be nice to use a nail gun, but wasn’t necessary. the next step is to caulk your holes and seams, paint, and wait! while waiting for the piece to dry, I spray painted the original hardware outside. 1. remove all drawers and doors. remove internal wooden drawer anchors anywhere that you want to add shelves. 2. clean the piece thoroughly and take measurements, if you are adding shelves. 3. put your piece on bricks first, then slide the dropcloth over the bricks and under the piece. 4. sand the exterior of your piece and also the front of the drawers. 5. secure the new shelves in place with wood glue. 6. caulk your holes and seams, paint, and wait! so what do you think? do you have any old pieces that you have big plans to update? 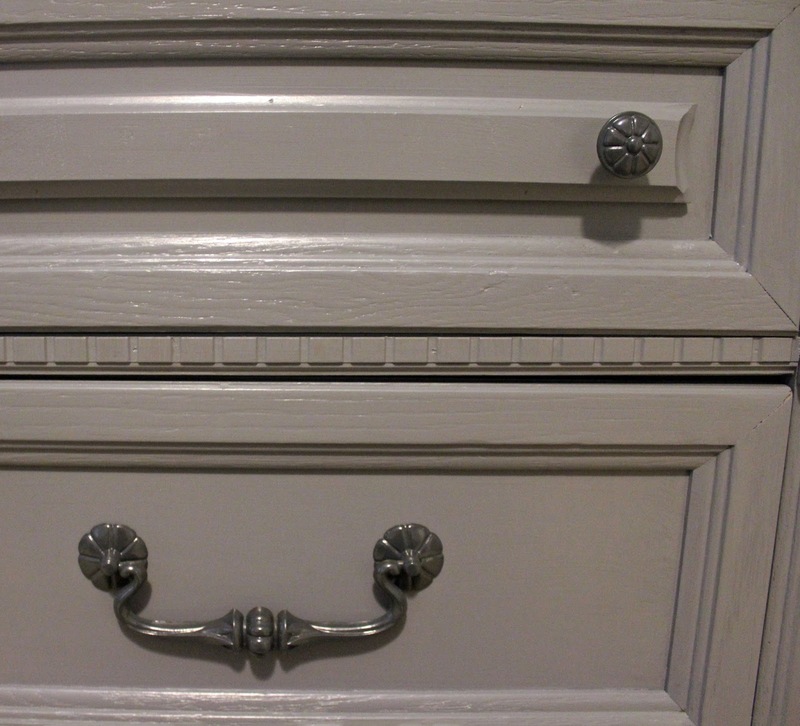 have you ever refinished old furniture?